Crabapple trees are one of the most giving trees in the garden. They start in spring, clothing themselves in massive billows of bright blooms, filling the air with their welcome fragrance. In summer, their sturdy branches provide a safe homes for birds and their young, and shade for delicate flowers in the garden. 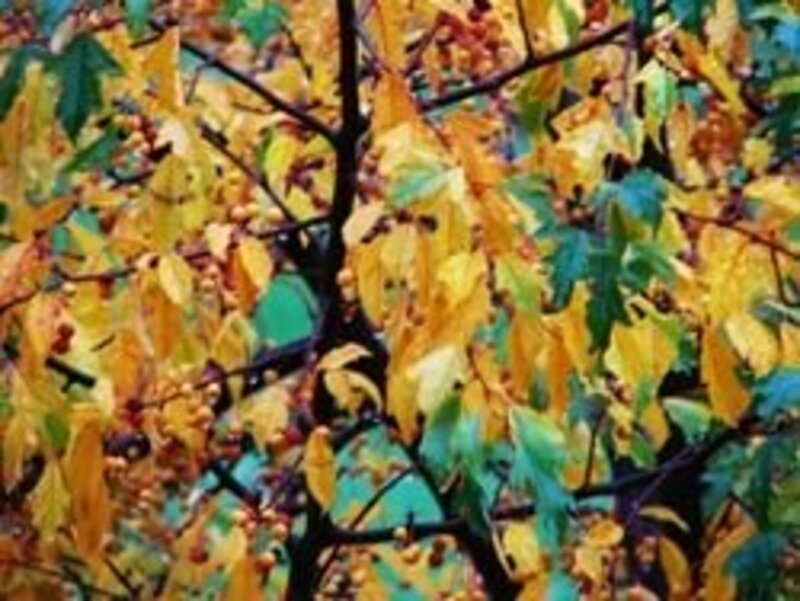 In fall, many varieties blaze with color before they drop their leaves. In winter, they provide a source of food for birds and other animals. 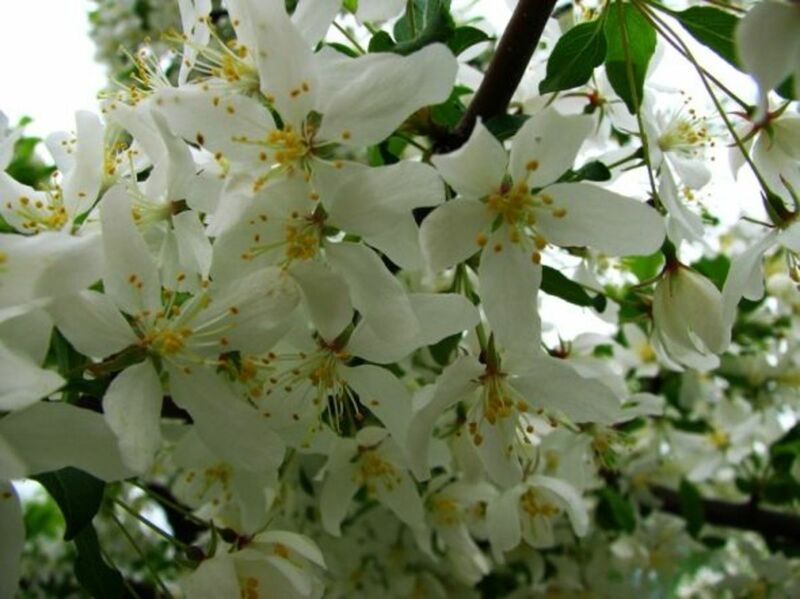 I am passionate about crabapple trees, their beauty and their wonderful giving nature. I hope to encourage others to plant one in their yard by sharing this lens with you. Please share it with others if you find it useful or inspiring. Pink Crabapple Tree - "Profusion" photo by Diane Cass. Do NOT use without permission, all rights reserved. 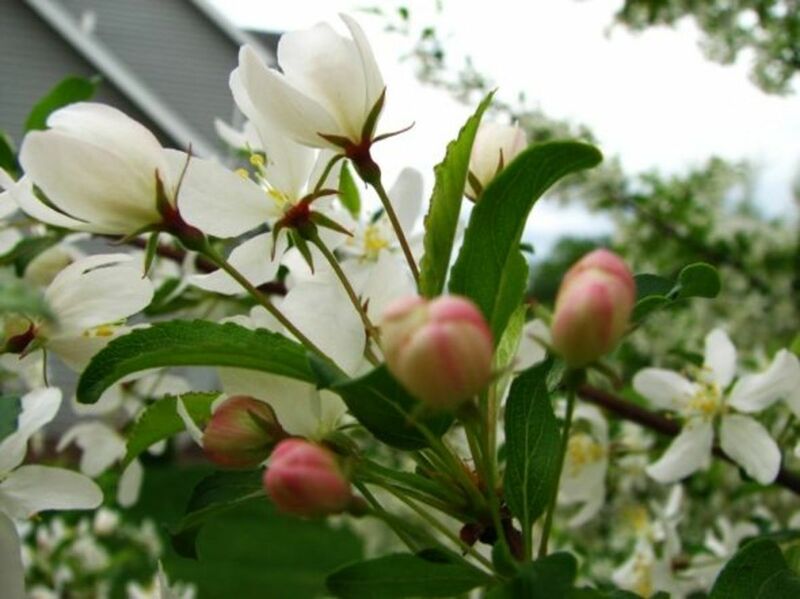 Crabapple trees are known for their beauty as an ornamental tree in the home landscape. They cover their branches in blooms for two to three weeks every spring, if undisturbed by wind or rain. Their early flowering provides a welcome source of food for bees and butterflies, after a long, lean winter. White flowering trees look stunning against homes with dark exterior paint schemes. Pink and red blooms enhance homes with white or light color pallets. We have one of each. 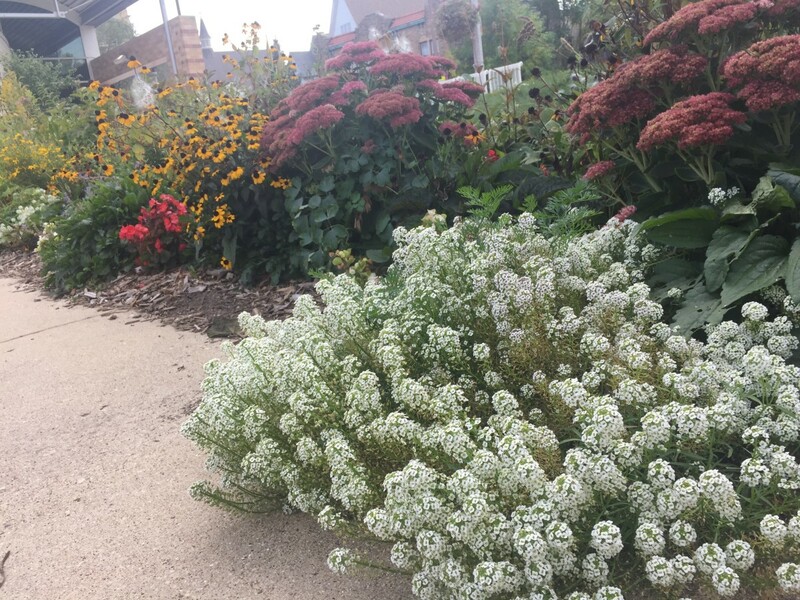 The picture in the introduction is of our deep-pink flowering "Profusion" in the front of our light-colored house. We have a lovely white tree in the back, where it is mostly seen against the green of the backyard lawn. Crabapple trees develop a thick canopy of leaves in summer. 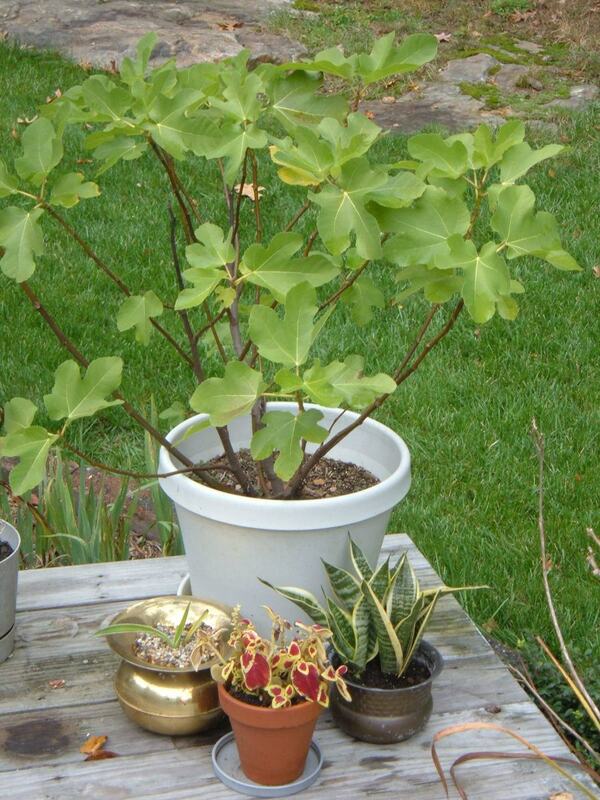 Many varieties have the added interest of leaves that are in colors other than green, or of unusual shapes. 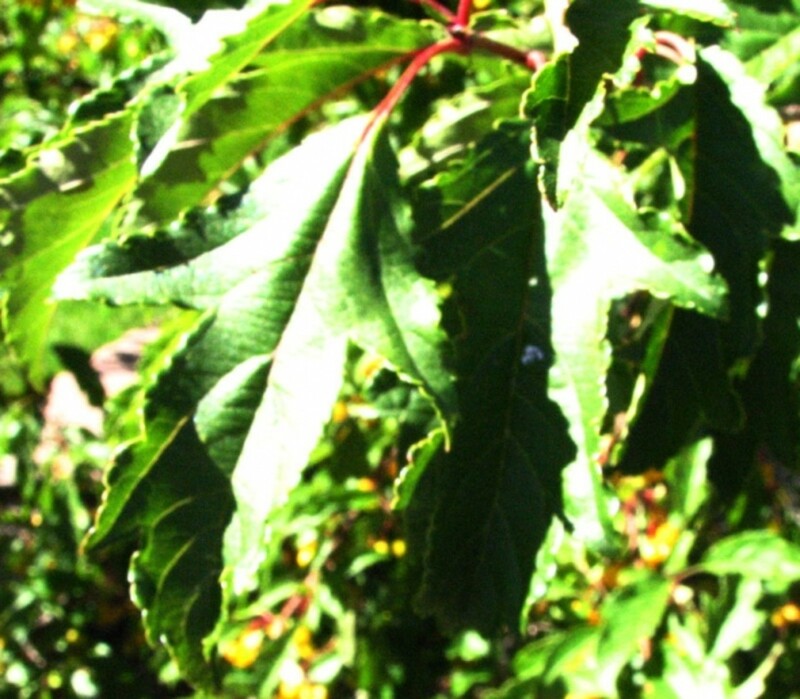 Our "Profusion" tree out front has lovely bronzy-red colored leaves in late spring, and turn rich green in summer. It looks great against the tan color of our house. Our "Golden Raindrops" tree out back has the most beautifully shaped leaves I have ever seen on a crabapple tree. They are deeply lobed, and look almost like an oak leaf. This gives a beautiful, lacy look to the tree in summer. Crabapple trees have done their duty for the summer, hosting families of robins, warblers and hummingbirds in their branches. In fall, many varieties clothe themselves in brilliant color in farewell to their feathered friends. Our "Profusion" tree out front turns a rich red before it drops it's leaves, leaving behind an abundance of small, ruby-red fruit. 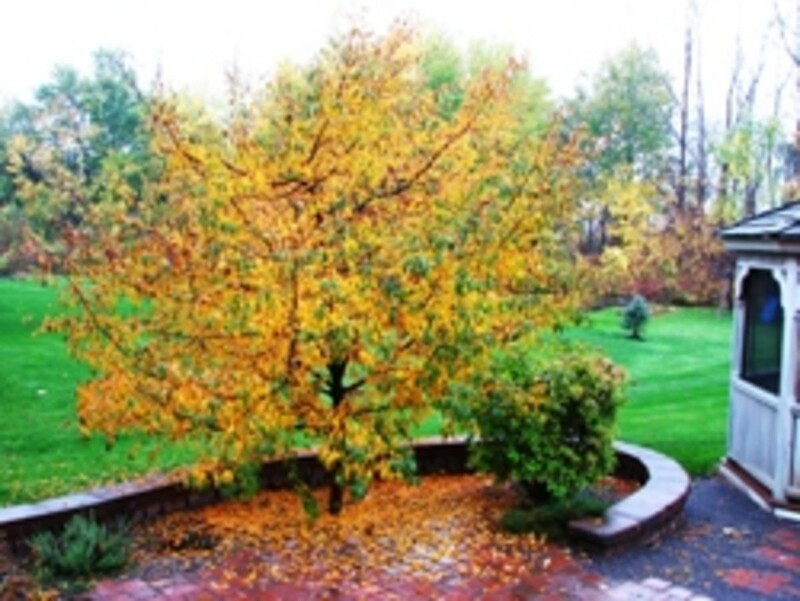 Our "Golden Raindrops" tree out back is simply breathtaking! 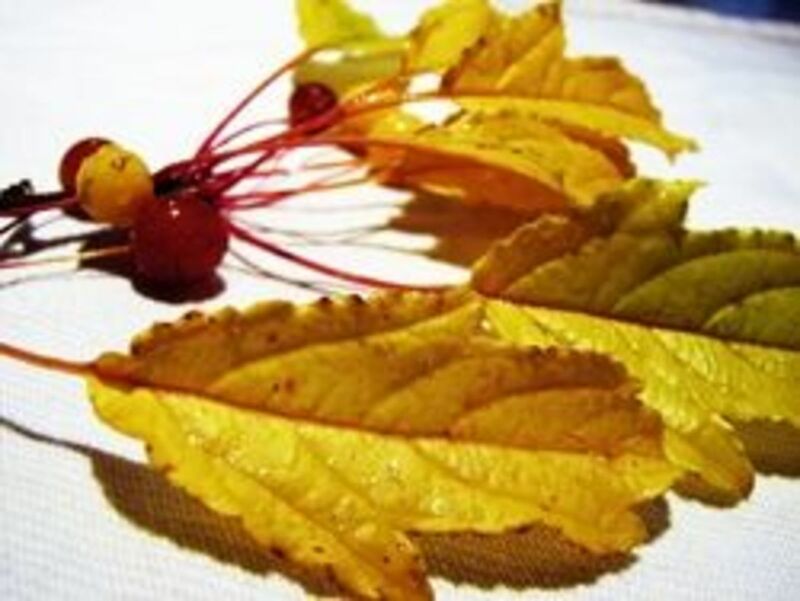 The oak-shaped leaves literally glow in a brilliant golden-yellow with each leaf neatly trimmed with a bright red rim. When the leaves fall, the golden glow remains in the form of small golden fruit covering the branches. You can almost see the birds drooling in anticipation of the feast to come. The fruit is hard still, and will need a few frosts before it is soft enough for the birds to eat. 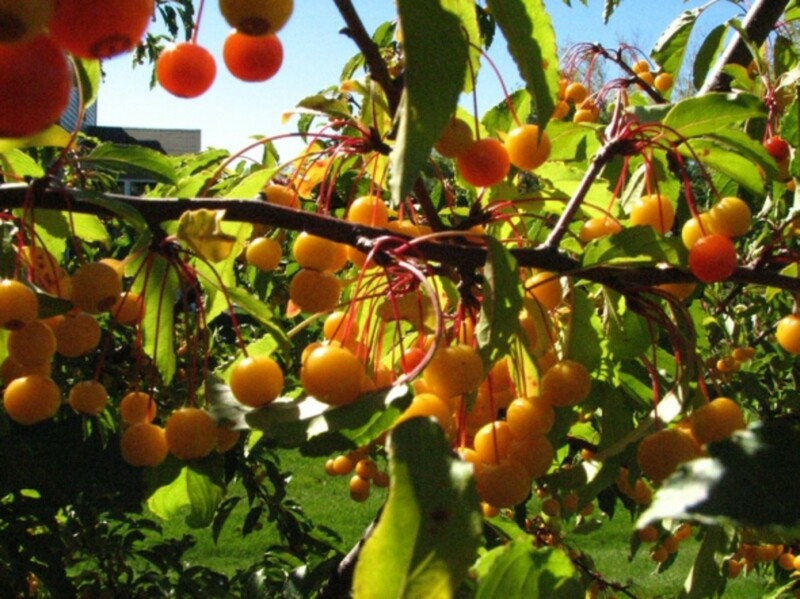 You can pick crabapples for canning or making jelly. They are naturally rich in pectin and make good jelly. They also add dimension and tang to homemade cider. It is, in fact, the secret ingredient of one of the best cider houses in Vermont, Cold Hollow Cider Mill. 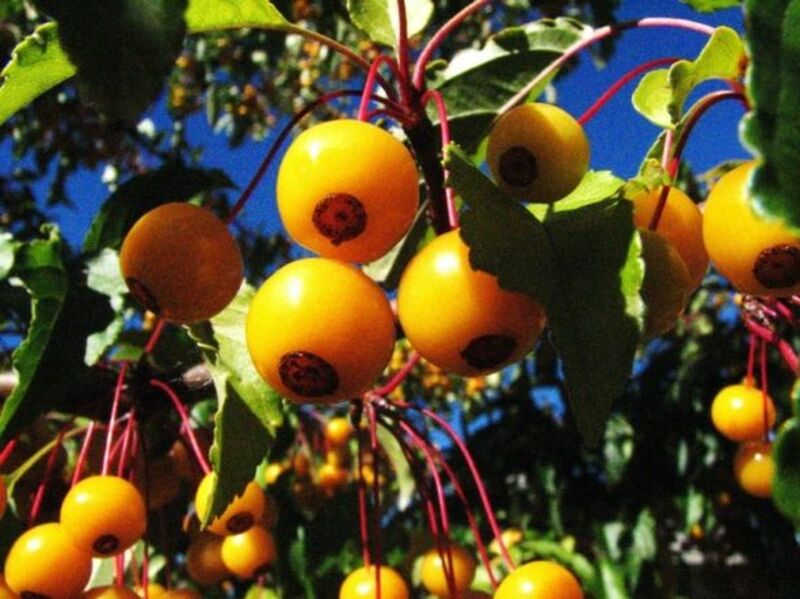 If you plan to use crabapples for cider or jelly, large-fruited varieties are best. Small fruits just don't have enough juice to be worth the effort. 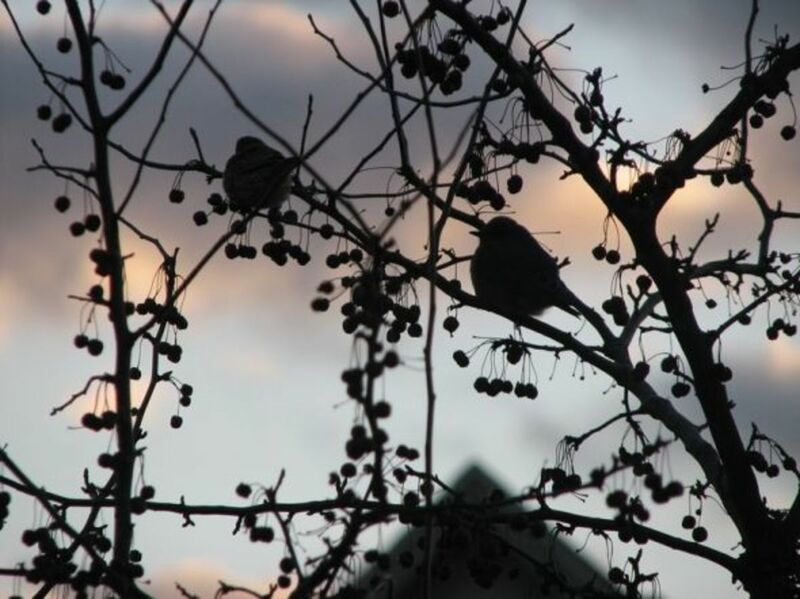 Leave the small crabapples for the birds to help them through winter. 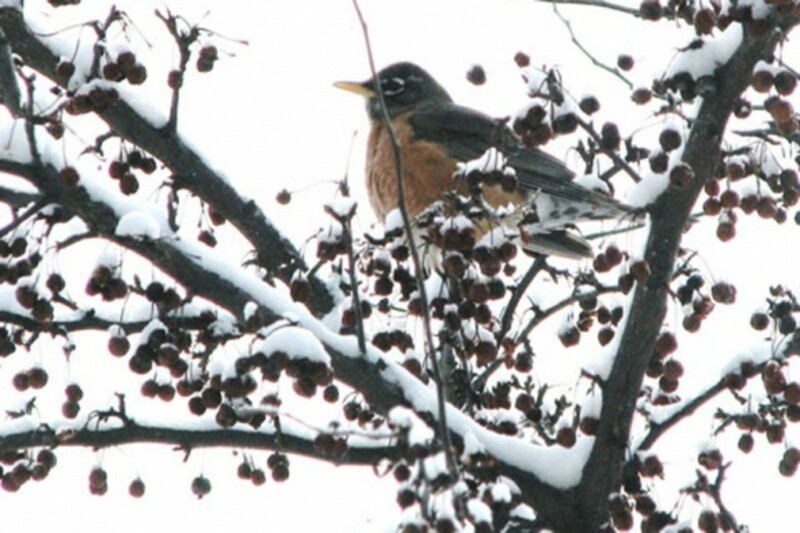 In winter, crabapple trees become a banquet for wildlife when food is scarce or difficult to find due to snow cover. The best varieties for winter-feeding have small fruit that stays on the branches all winter. Trees that drop their fruit when ripe only benefit wildlife briefly in the fall. Their fruit will litter the ground, making it available only for a short time. The fruit soon rots, benefiting only the tree as fertilizer. People also view the dropped fruit as an unsightly mess. Trees that hold their fruit, however, are a different story altogether. The fruit retains its color for a long time, adding interest to the winter landscape. It also softens in the cold weather, making it easy for birds to eat. Most of the fruit will stay on the tree, but some will fall, feeding the ground dwelling animals as well. Our crabapple trees have become a focal point of the wildlife in our neighborhood. The animals that I have seen enjoying the fruit are; birds, deer, rabbits, possums, and many more that leave their tracks, but that I never see. Crabapple Trees in Winter - The table is spread. Who is coming for dinner? Bluebird in the Crabapple tree. This was in the dead of winter in January. The "Golden Raindrops" crabapple tree in back. Here, it is covered in golden fruit...sometime in December. By March, it is stripped bare and all the apples have been eaten. 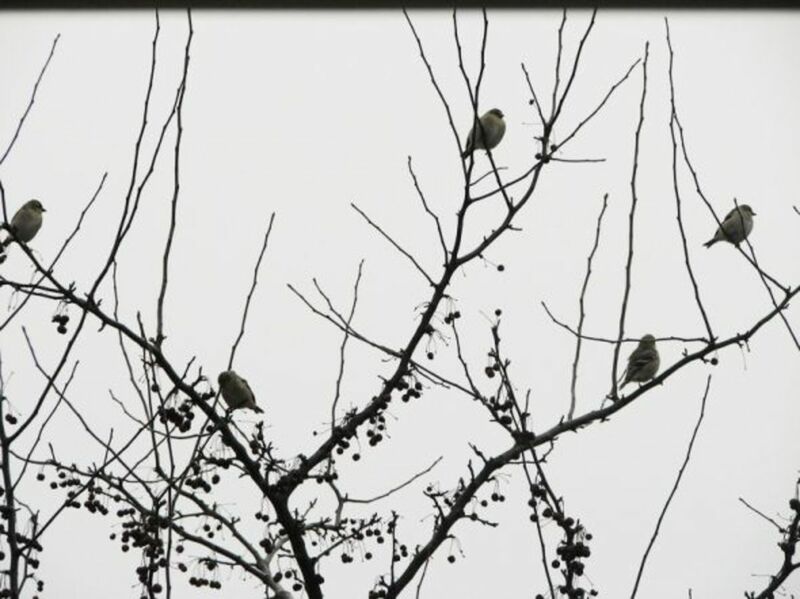 A flurry of finches enjoying the crabapples. More finches in the crabapple tree. Many people don’t realize that even bluebirds will stay through winter if they have a consistent food source and shelter. We have a pair of bluebirds that live in our yard year-round, even though we live in the cold Northeastern United States. We don’t usually think of bluebirds as fruit eating birds, but they eat from our crabapple trees all winter. We also leave our birdhouses up to provide them shelter from icy winds and snow. 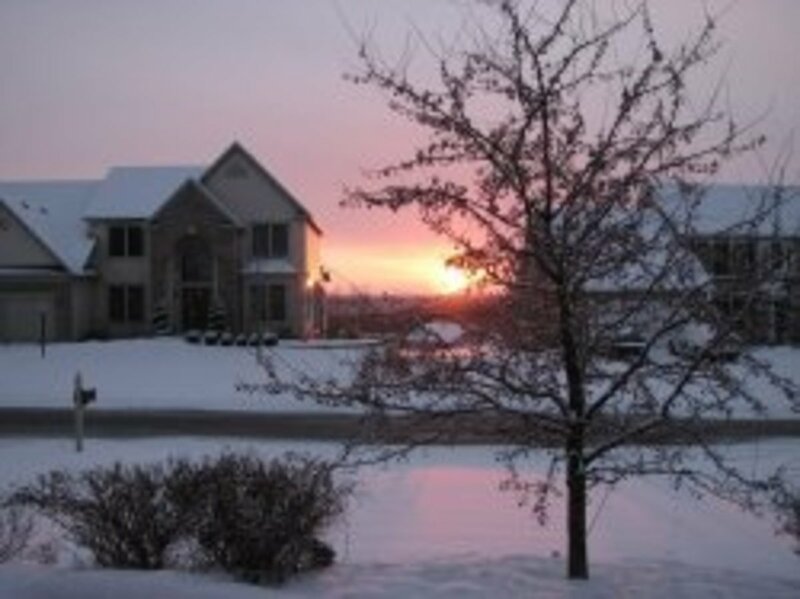 The full value of a crabapple tree that holds it’s fruit through the winter is revealed as winter melts into spring. Food is very scarce at this time, just as birds begin returning from the south. 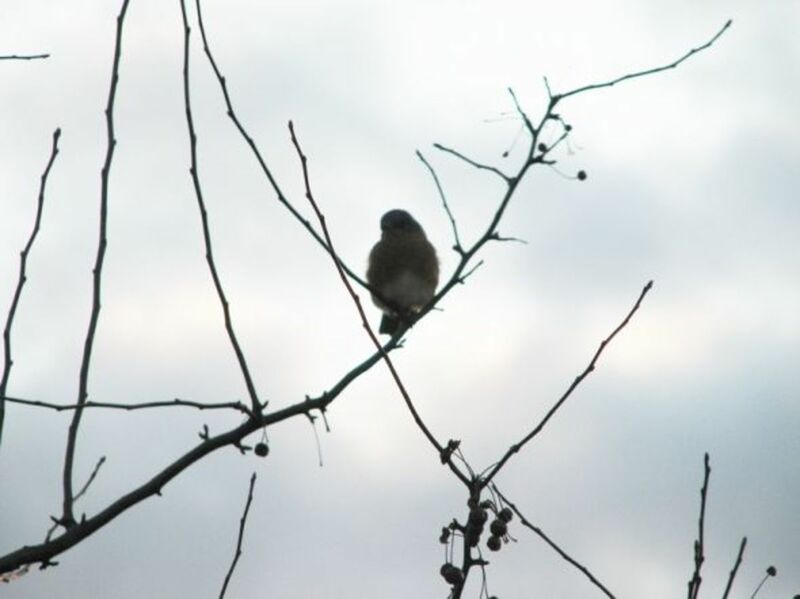 Our trees are the first stop for birds returning from their southern wintering grounds. I have counted up to a dozen or so robins in the tree at one time, in early February, feasting on the crabapples still hanging on the tree. We had a new visitor this year, a possum. 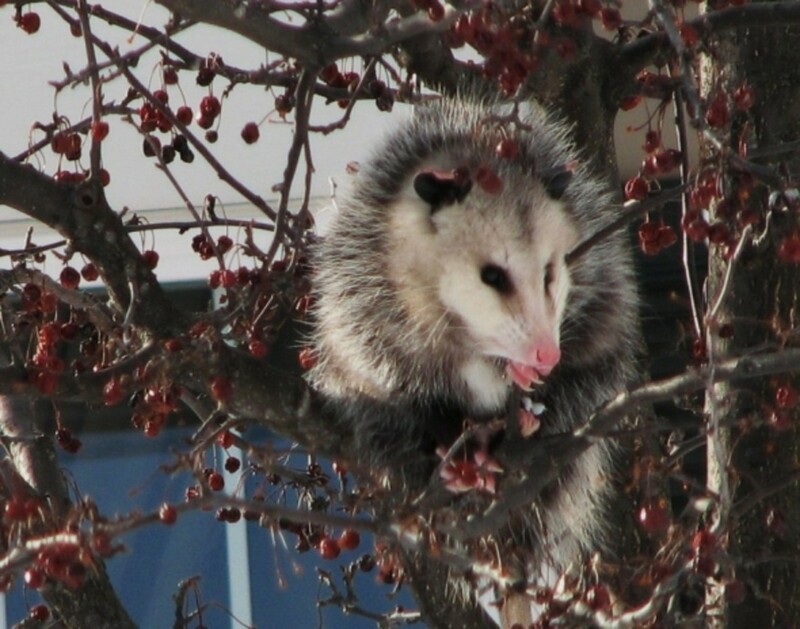 He would come in broad daylight and spend a couple of hours lounging in the branches and daintily eating crabapples. He was the thrill of the neighborhood children, since possums are usually more secretive and nocturnal. So, now you are excited and ready to buy your crabapple tree. 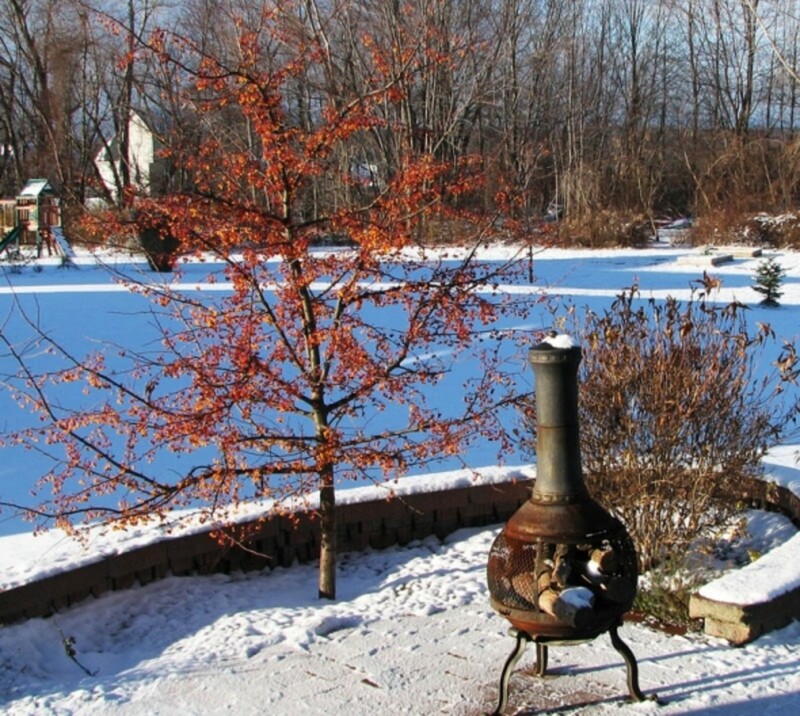 What should you look for in order to choose a tree that is best suited for your home environment? Here is the basic information you should be aware of to select a tree that will be successful in your garden. 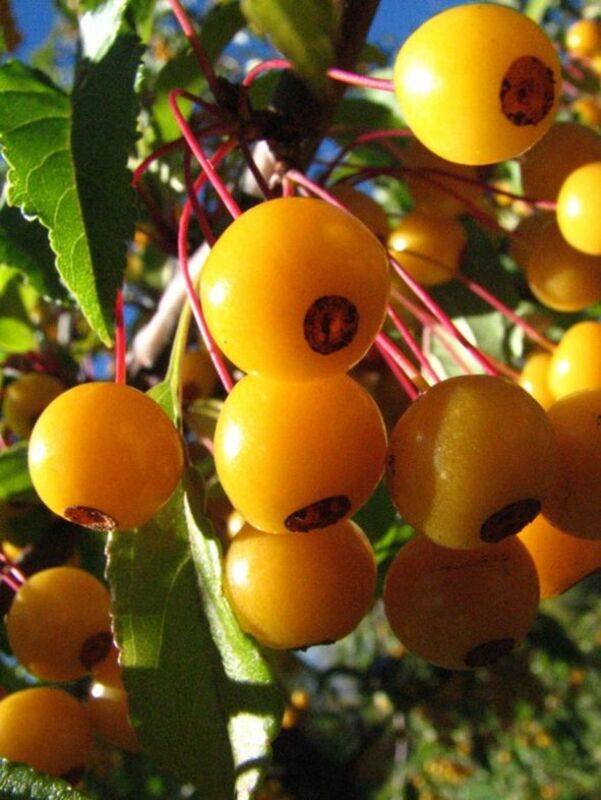 Zones: Crabapples can be grown in most areas of the United States. Generally, they are winter hardy to zone 4, and can tolerate the heat up to zone 8. Some varieties have been specially developed to grow and bloom beyond those zones. Most local nurseries will only stock trees that will grow successfully in your area. If you are buying from a catalogue or online, check the growing zone information carefully before you purchase your tree. Color: In general, choose a tree that will complement the color of your home. Trees with dark blooms look better with light color houses and visa-versa. 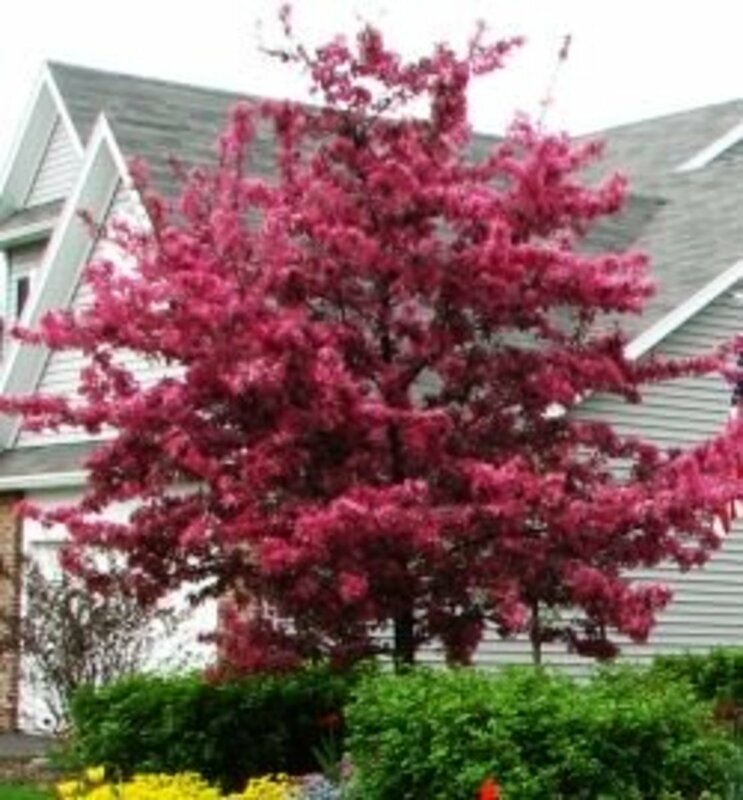 Most people think only of flower color when determining what crabapple tree to buy, but there are many more things to consider about color besides the blossoms. Some trees have interesting colors in their leaves. Our “Profusion” tree out front starts out with reddish-bronze leaves in spring that compliment its pretty, pink flowers. The leaves change to deep green in summer, setting off the ruby-red fruit. Some trees, like our “Golden Raindrops” give a spectacular show in fall, with blazing gold or red leaves. There is also the color of the fruit to consider. For trees that hold their fruit over the winter, red or golden fruit can add interest to an otherwise bleak landscape. Height and Spread: Most crabapple trees do not get very tall, making them a nice accent for the front of your home. They also usually spread in proportion to their height. 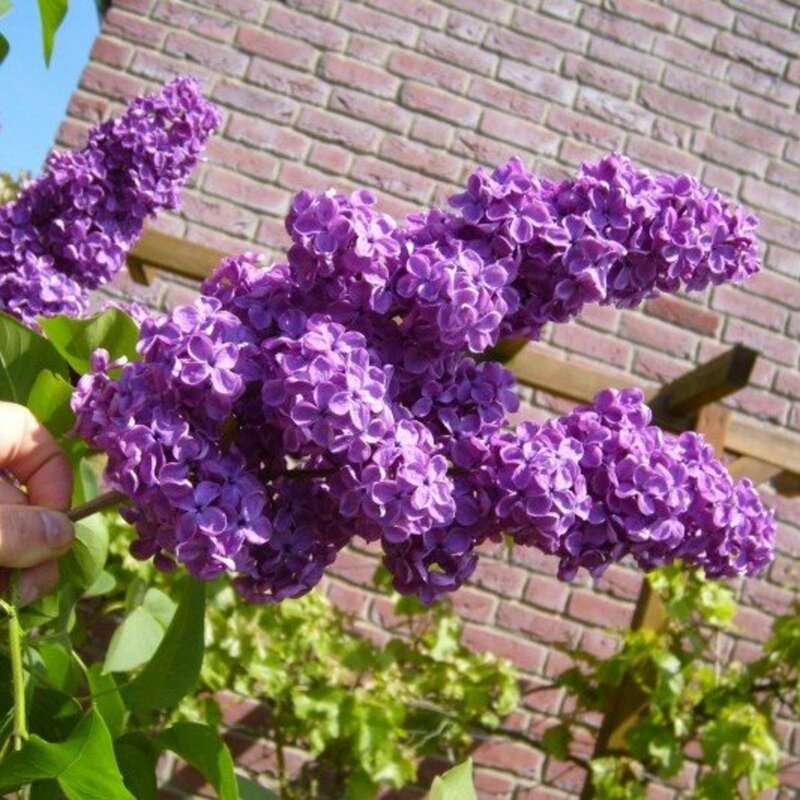 Some grow in weeping or dwarf forms giving you an even more compact look for tighter spaces. One tree even grows like a column, spreading very little over time. Make sure that the tree you pick will fit in the spot your are going to plant it in, taking into account room for future growth. 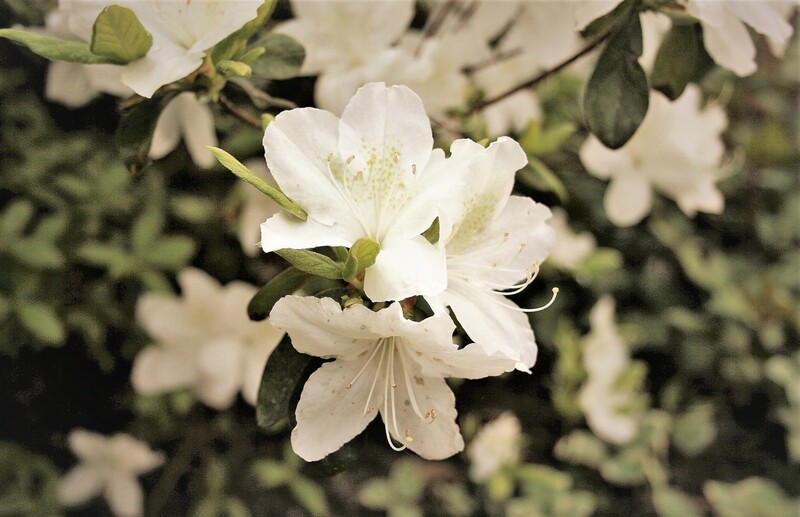 "Sargent" - White blooms - Red fruit - Shrubby dwarf variety - Sometimes blooms and fruits profusely in alternate years. Apple Scab denies tree of fruit, and tree is losing it's leaves. My poor Profusion crabapple tree. It has been languishing all summer. I noticed there was something wrong in early summer, when it appeared that the tree didn't have any fruit. At first I thought that maybe the blossoms didn't get pollinated, due to the unusually long, wet spring we had this year (2011). It wasn't until later in the summer, when all the leaves were turning yellow and dropping off that I got truly alarmed. I noticed that nearly all the red-flowering crabapples in the area (that I know about) are suffering the same fate. An investigation and a little research determined the cause. Apple Scab. It is a fungus that can develop in wet weather, can cause fruit not to set, and leaves to fall. It seems that red-flowering trees are especially susceptible to this disease. It makes me so sad to see my beautiful tree looking like this. I am especially concerned about the birds and animals that use this tree for food in the winter. Our Golden Raindrops crabapple in back (a white-flowered tree) is fine and will bear fruit. I am thinking of making a feeder for the birds to provide raisins for them in lieu of the crabapples. 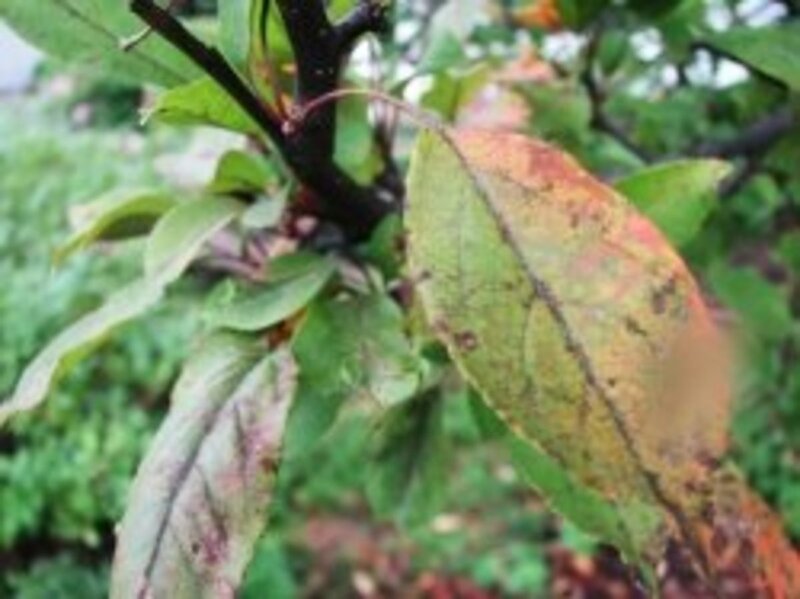 If your tree has suffered from Apple Scab, you might want to do this too. 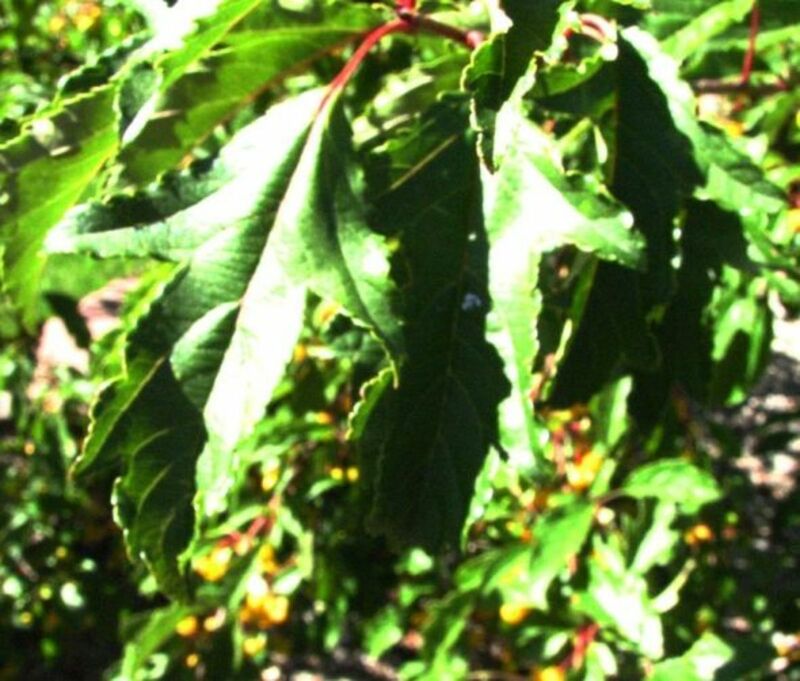 For more information on diseases of crabapple trees, click on the link below. Most fungal diseases can be fought, and are usually not lethal to the tree. Bacterial diseases will kill your tree. It is important to know how to prevent conditions that foster the growth of pathogens. It is also important to know if the tree you want to buy is susceptible to any diseases before you buy. This year has been hard on my poor "Profusion" crabapple tree out front. We had an early warm-up in the Spring that brought on early flowering. A week later, we had snow again.This killed most of the buds and as a result, we have few crabapples this year. This is now two years in a row that we have gotten little to no crabapples on the tree due to weather. Again, our "Golden Raindrops" tree out back was completely unaffected. It bloomed about two weeks later than the pink flowering "Profusion", so it completely missed the deadly warm-up/freeze cycle we had this spring. It bloomed fully and is now loaded with tiny, golden crabapples for the birds this winter. The pink flowering crabapple is beautiful and I love it, but I am beginning to favor my white-flowering "Golden Raindrops" crabapple tree. It has come through two difficult springs unscathed, and in fact is thriving. 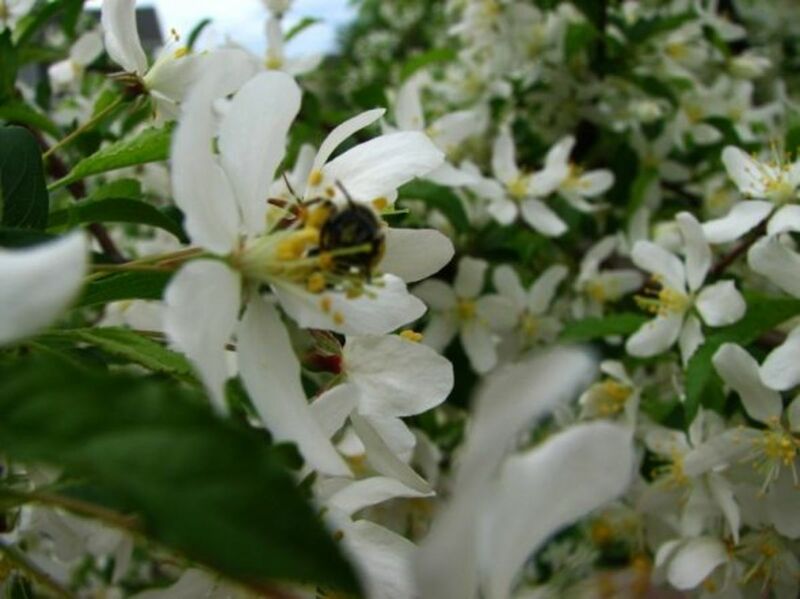 If you are thinking of planting crabapple trees for winter food for local wildlife, consider using white-flowering carbapples, or at least a mix of white and pink. This would ensure the best chance of a healthy crop of crabapples for the birds to enjoy through the winter. My prairie fire crab branches are too heavy and I lost a large branch. Can I lighten up the others in first week of September? 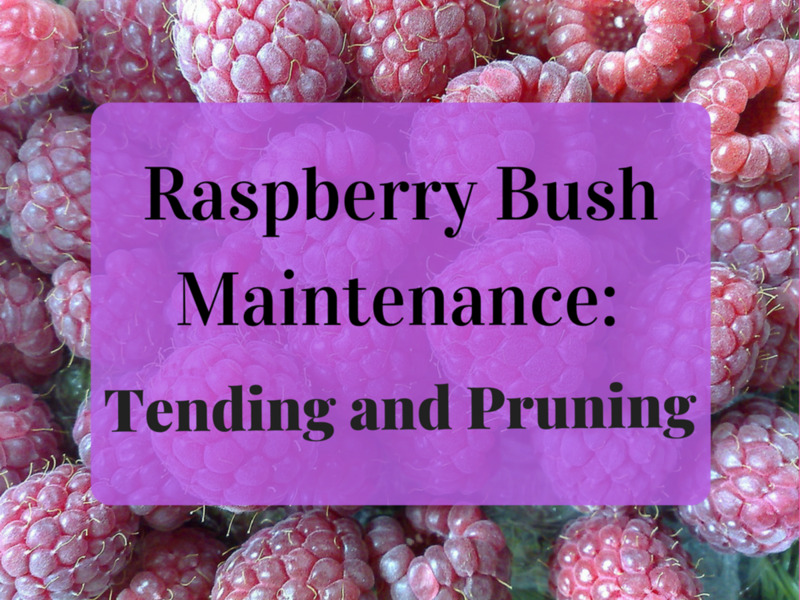 You don't want to do any pruning in the fall. Wait for spring while the tree is still dormant. If you need to help sagging branches (it was a good year for my trees this year too...VERY heavily laden with crabapples), try propping them up for now. 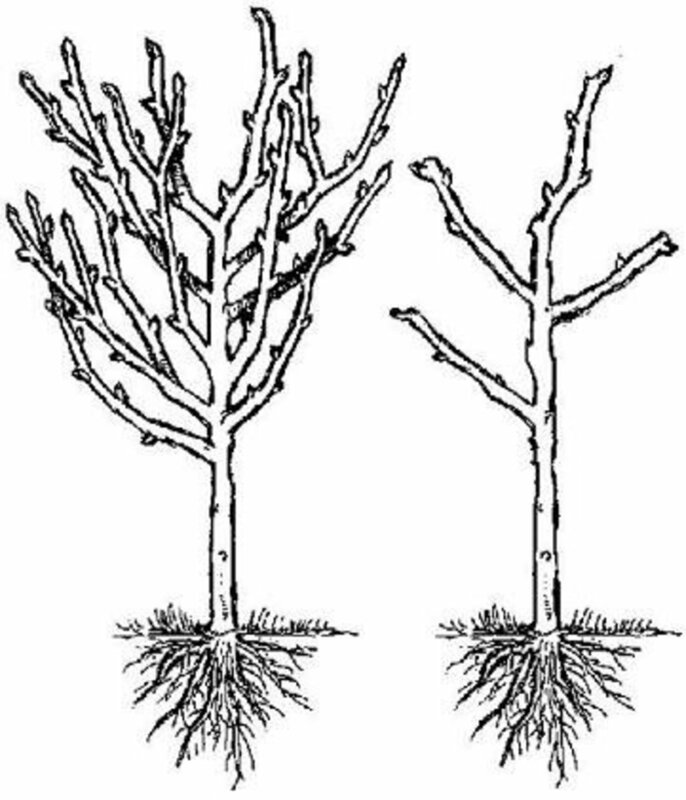 Give a good pruning to your tree next spring. Sometimes, you can save a branch that split. 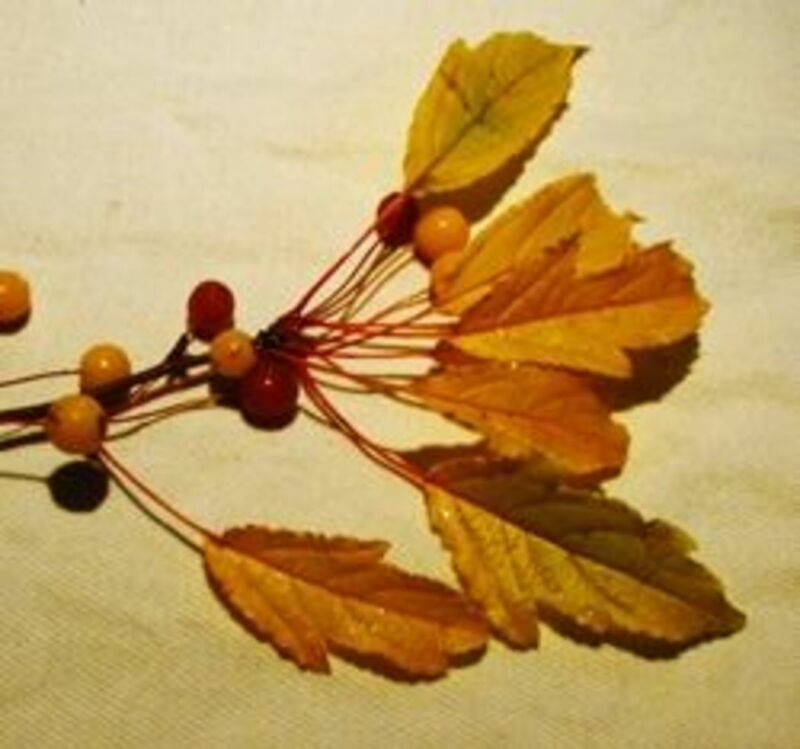 Use a method similar to grafting branches onto trees. We saved a branch this way once. I think my husband used screws, glue to dress the wound and keep bugs out, and propped up the branch. There are lots of good websites on how to do this if you do a Google search. Does the Robinson hold its fruit for the winter? It does seem to hold it's fruit through winter. The descriptions I found say that it "fruit may persist into winter," that the red fruit is a color interest in winter (which means that the fruit doesn't drop), and that it is a good food source for wildlife, which also usually means that the fruit is persistent. My friend's crab apple tree bloomed pink blossoms for 4 years but this year, the blossoms are white! Is this normal or do they have a problem? Perhaps the soil from which the crabapple tree is growing is missing some nutrient. I know that hydrangeas can have different colors of flowers, on the same plant, depending on whether the soil is acid, or alkaline. 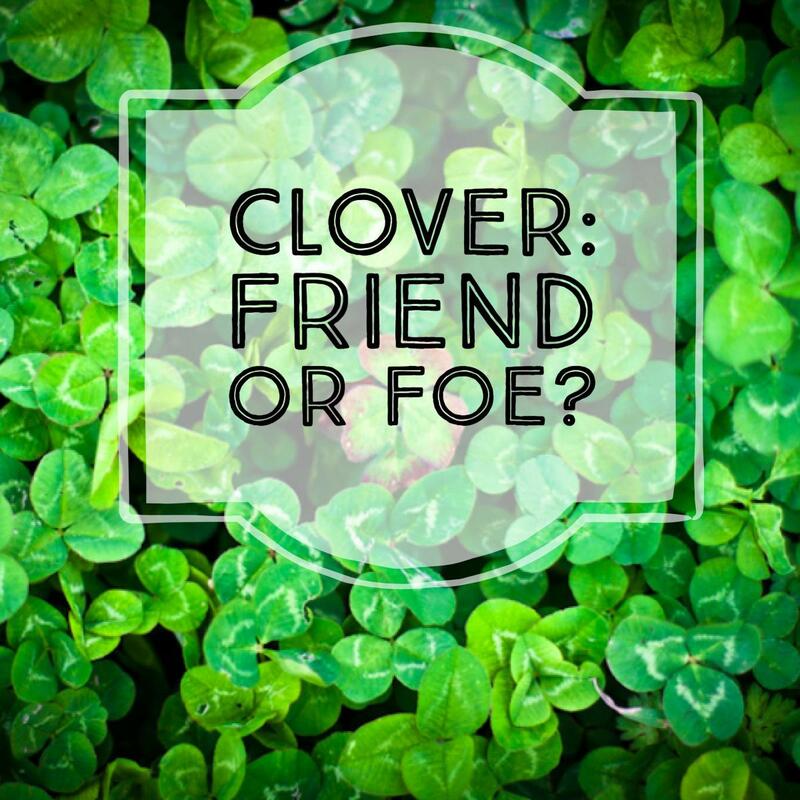 Your friend can have her soil tested, or ask a local nursery. Are there crabapple trees that don't drop anything? Yes! There are many varieties. The two I mentioned in the article, Golden Raindrops and Profusion both hold their tiny apples all winter. This is an excellent winter food source for birds and other wildlife. When picking a tree, ask if the trees holds its fruit. 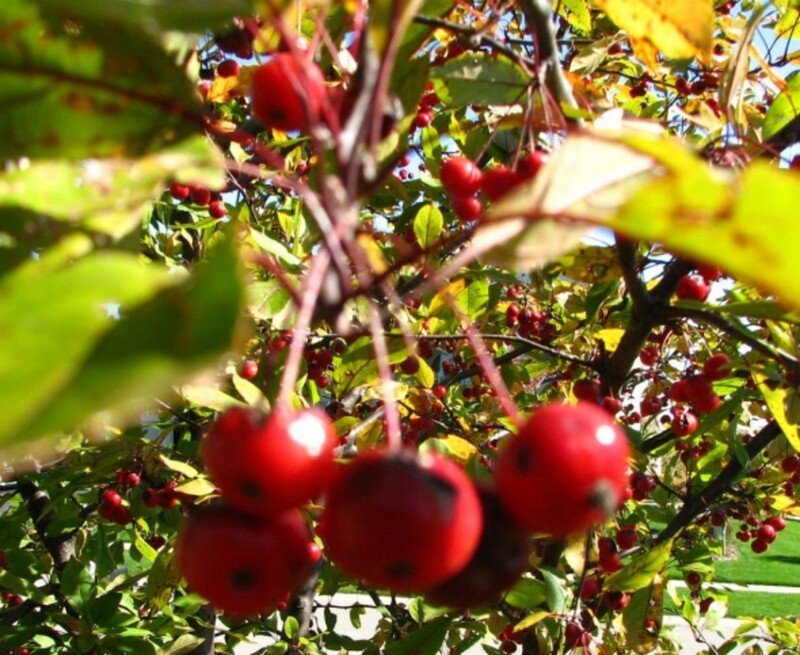 Can crabapple trees live over forty years and still bear fruit? Yes! We had friends in Vermont that had a tree that was over 100 years old and bore the most luscious, delicious fruit! Our Red Flowering Crabs still have their berries and its almost February. Hope the birds and animals start eating soon. Had some many berries that we had to prop the limbs up so they wouldn't break off. Looked like a weeping crab. I hope your tree made it through this hard winter okay. Almost time for spring blooms. We have a regular apple tree in our back yard and it provides us with a bounty of fruit in the fall. It is nice to know it is organic. @Lee Hansen: Some crabapple varieties have apples that are quite large. Not as big as a regular eating apple, but still, maby the size of a golf ball or a little larger. We had a friend in Vermont with a 100 year old crabapple tree. It had large fruit and the fruit was SWEET! They were the most delicous apples. We have an old apple tree in our yard that hubby misnomers as a crabapple. I think he means scab apple ... but it's lovely in spring and wildlife like the undersized apples. Crabapples are truly beautiful trees, especially in spring and fall. This is a lovely lens! I enjoyed looking at the beautiful blossoms and thinking about spring being just around the corner. We don't have a crabapple tree, but our neighbors do. I'll have to check and see if the local possum is eating their fruit - love that video of the possum! Nice lens. Can't believe this lens was flagged too. Hope you can fix it before time out. These are pretty trees! I love the one with the pink flowers. I don't have any, but this is a beautiful lens. They are beautiful. I had a crabapple tree in the yard where I grew up. It was very pretty. We don't have crabapples, but we have a giant apple tree in our garden that is in full bloom right now. And I love your photo galleries - gorgeous! Yes, with both pink and white blooms. Love them. Great lens! Great lens.Being a landscaper I do plant many crab trees on a regular basis davids,GRD,Sargents and Red jades.I have more than 40 scheduled to be planted already on many jobs because of a large heavy wet October snowstorm that destroyed so many crabs and pears out here in Massachusetts. Loved Your Lens! You really put a lot of good information in it. What truly beautiful trees - thanks for sharing these photos! Blessed by a SquidAngel! This is a truly beautiful lens. The photos, the information, the portion from Carl Sandberg.....great touch! Top notch work; blessed! I don't but wow are they BEAUTIFUL! This lens is beautiful too.. all the glorious pics.. ahh I can almost feel spring. Angel blessed. Just came back to look at those beautiful photos. The leaf colors on these crabapple trees are STUNNING. I didn't even know that there was a crabapple before this lens. I learned a lot and really enjoyed the pics. Thank you! Love all the photos showcased here in this lens. love 'em! 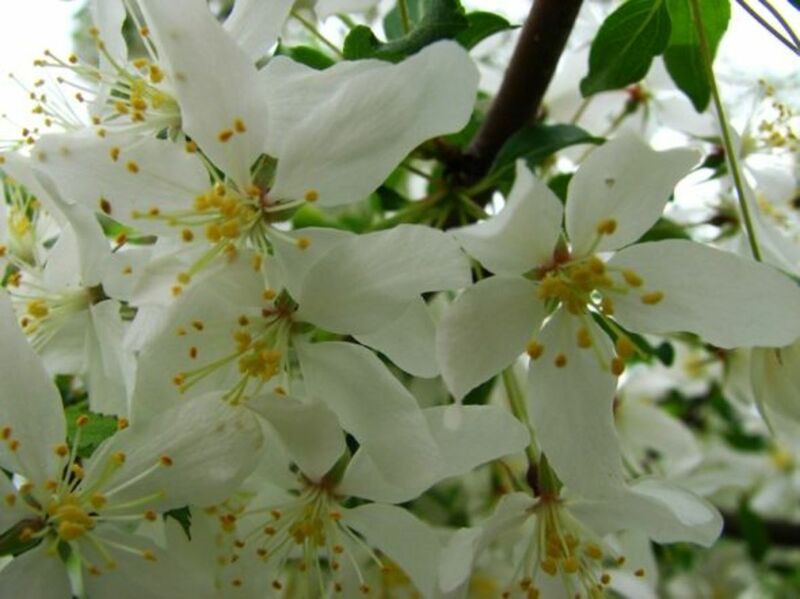 Great job on finding all these great photos of crabapple trees. Glad I browsed by tonight. If you like to browse lens as I do, mine has a great educational topic with poll questions for my readers to enjoy. Such a gorgeous tree. I wish I had some here. May have to do some planting! Love the opossum picture and video. So cute! What beautiful blossoms and photography! I LOVE any tree that flowers. Great lens! Congratulations on your purple star! We deserved honor! Gorgeous photos! I'm going to have to get me a crabapple tree -- or two, maybe more! I guess they grow OK in the South? What a beautiful lens Diane! @Virginia Allain: I have friends with mulberry trees. I'll have to get some pics when they are in bloom and do a lens on mulberries. Great idea Virginia. @Diane Cass: Can you find some mulberry trees to take photos of and make a lens on that tree next? This might be your niche. @Virginia Allain: You're such an angel Virginia. Thank you for the encouragement. Blessed by a Squidoo Angel. Lovely pictures, personal relationship to the subject and good coverage. Well done! @NHgal LM: Oh yes, birds love Mulberries. I did't know they got tipsy with them though. I bet the mulberry stains would never come out of the laundry. @Diane Cass: My inlaws had a mulberry tree. When the fruit got overripe, the birds got tipsy, and deposited a purple mess on the laundry hanging outside. Great lens. @bossypants: Yes, I think they were a little drunk. I've heard of that happening. What a funny sight that would be. I grew up in a house with a Dolga Crab in our front yard garden. The multiple freezes and thaws must have fermented the fruit because it often looked like the birds and squirrels got a little tipsy. The spring blossoms were such a joy! I love the crabapple trees, especially in blossom! Spring is my favorite season too. I used to love eating the crabapples as a child, and you are right, they make nice jelly. Nice pictures! 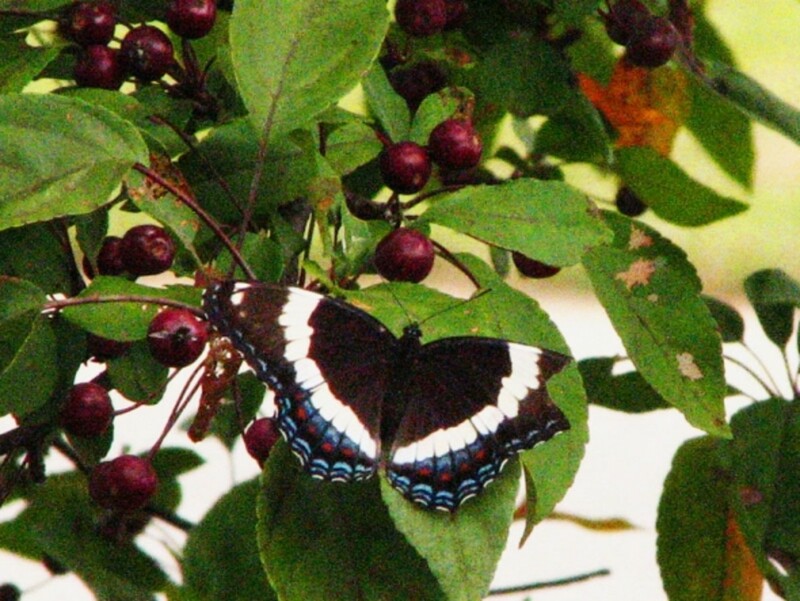 I love the white admiral. They eat fruit and your trees provide a wonderful dinner plate. This is such a beautiful lens and so informative about the Crabapple Trees. My thoughts immediately went to the path I took walking to school as a child. Your lens even conjured up the smell of the Crabapple Tree as I carefully strolled to school (being careful not to step on a crack for fear of breaking my mother's back). Thank you for this wonderful read. This is wonderful information. I want to grow a crabapple tree. The tree in your Spring photo is beautiful in bloom. What vibrant color! Diane, your lens brought back memories of childhood in Kentucky to me. The crabapple trees were so wonderful in bloom, and yes, the little apples were so good for the birds. I like this lens, and I don't think it is too long. I have ones much longer. 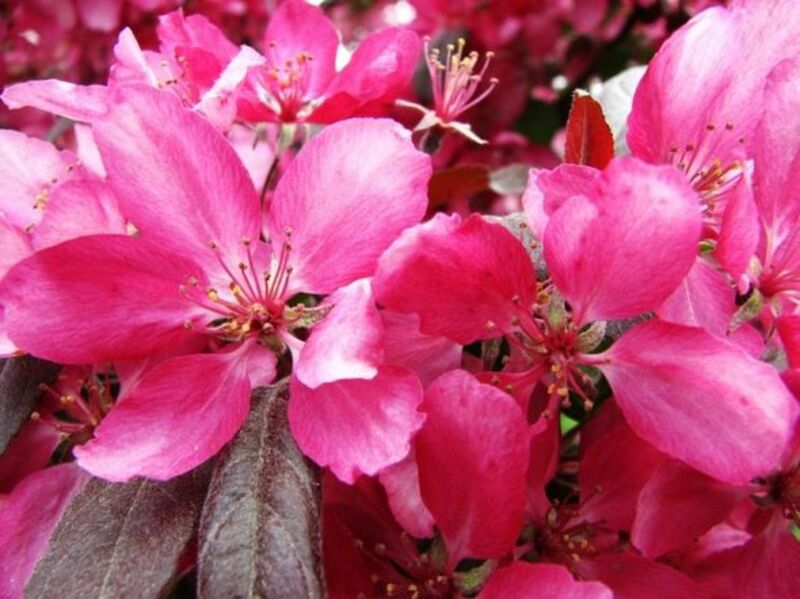 Your crabapple tree is gorgeous and I can see why you are featuring it on these Zazzle products. 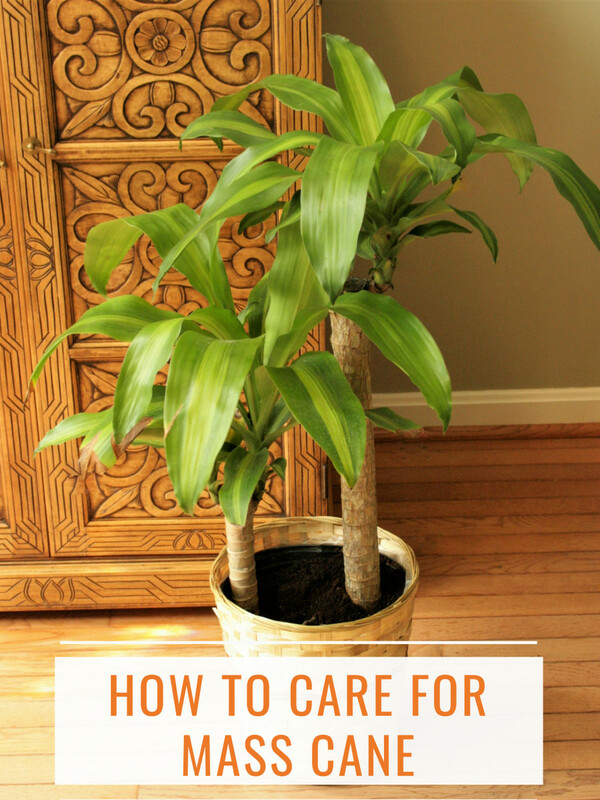 What do you do to take care of your tree? Hi all. I'm still learning how to use Squidoo. This lens is a work in progress. I would love to hear from expert lens masters how I can make my lens better and be successful on Squidoo.